You’re ready to do some stretches for sciatica after having been through a few days of screaming pain from your sciatic nerve. If sciatic pain has been a recurring episode for you then the sciatic nerve stretches, when done on a regular, consistent basis can help ward off future pain from the sciatic nerve. 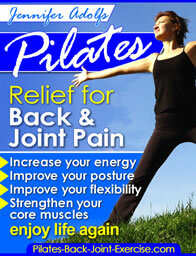 Allow the pain to settle for a couple of days before you begin to do stretches for sciatica. The sciatic nerve stretches should focus on exercises that stretch the lumbar spine and throughout the sacrum. Doing this will help your body become more flexible, which will increase your normal range of motion for day-to-day movements. -This stretch is done lying flat on your back with a band or towel wrapped around one foot, the other leg is extended and should not lift up off the floor when you pull the other up. -Exhale as you pull the leg with the band straight up until you feel the stretch in the back of the leg, hold for a two count, then bend the leg at the knee to relax it. -Repeat this glute and hamstring stretch for 8 –10 repetitions on both legs. -Take the stretch to a point of slight discomfort, not pain! Generally when I have clients come in following an episode of sciatica pain I have them do a series of stretches to loosen up the lower back and piriformis muscles deep in the buttocks that can contribute to the pain. -Lie flat on your back with one leg extended and one leg bent at a 90 degree angle. -Keeping the body and pelvis still circle the bent leg 8 times each direction in the hip socket. -The lower part of the leg does not move only the thigh in the hip socket. -Repeat on the other leg both directions. Find this exercise and its progressions from the Leg Circles page. Find these sciatic stretch exercises and loads more in the Pilates ebook available here. GET RELIEF NOW! -Lying flat on your back with knees bent tilt the pelvis so the back flattens and the pubic bone rolls up curling the tailbone off the floor. -Exhale as you scoop out the abdominal muscles flattening the spine and curling the tailbone off, and then inhale to relax the tailbone back down. Repeat this exercise for 8-10 repetitions. -This sciatic stretch can be done standing or sitting as well using a wall or chair for the back support. -Lying in neutral on your back pull one knee to your chest and extend the other leg to the ceiling or a slight angle down as shown here. -Switch legs as you breath in and out pulling your abdominal muscles down flat as you extend the one leg folding the other leg in. -Feel the stretch in your buttocks and hamstrings as your sacrum stays heavy on the floor and the hips crease as the thighs fold in, repeat for 10 repetitions. This may be one of the best stretches for sciatica and to help strengthen the lumbar spine and stabilize at the shoulder joint. -Lying on your stomach with your hands just outside your head press up onto your elbows drawing your belly button up and in lifting the chest and ribs off the mat. Hold for a 3 count then release back down. Repeat this up to 10 times working to press to your hands straightening the arms. If your sciatic pain has been chronic and you cannot get rid of it with any of these exercises then I would reommend a relaxation pose to just release the piriformis muscle. This can be accomplished by lying on your back and bending the knee and bringing the foot of the affected leg up against the inside of the other leg and just lying and breathing trying to relax the muscle. Try keeping your hips even with the ceiling and your bottom flat on the floor or surface where you lie. There are many sciatic nerves stretches that you should avoid! -Any standing toe touches, straight down or to the opposite foot. -A quadriceps or thigh stretch standing with the knee bent. -Standing hamstring stretch with the leg straight out resting on a bar or table. -Lying on stomach arching head and neck backwards or up. -Sitting with legs crossed in lotus position and rounded back. Leave stretches for sciatica and find more exercises for your hips in my free pages here.